As covered in the History section, the Society’s miniature railway has had a long period of progressive development. 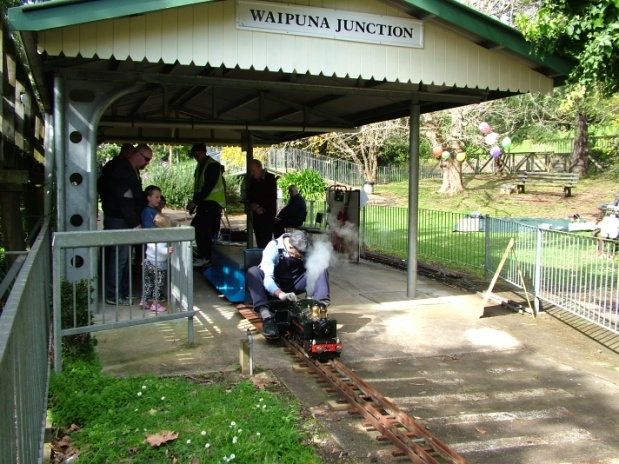 It provides a place for members who build miniature railway engines to operate and test their creations. 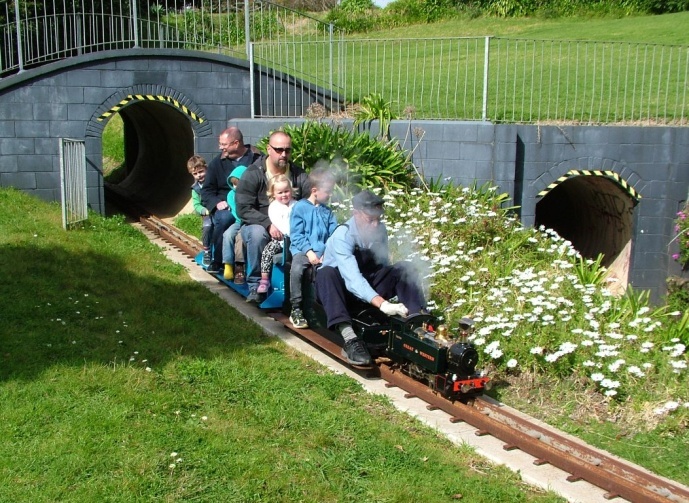 It has also been operated voluntarily by members for over 50 years on most Sundays giving the public train rides, thereby allowing the community to enjoy low-cost family fun in a pleasant park-like environment. The railway currently has a running distance of 652 metres and provides three different gauges – 3.5, 5 & 7.25 inches (89mm, 127mm & 184mm) with a ruling grade of 1 in 60. 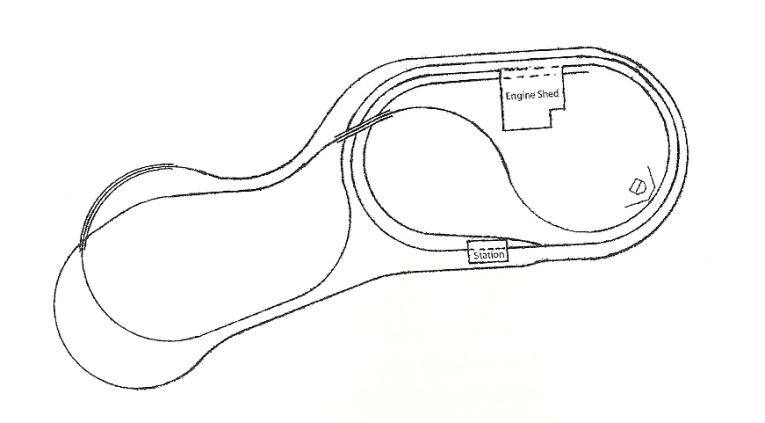 The alignment of the railway follows an interesting route with several circles joined by a crossover, in effect, a figure eight with a circle around the outside but joined to provide a continuous track (see schematic). It is a real track for drivers, with steep (in railway terms) grades up and down and many varied features along the way to make it a most interesting & scenic railway for passengers to travel. One minute, you can be travelling alongside another train, with both going in the same direction – then it may disappear for a short while and when you next see it, it is going the opposite way to your train! It takes a few rides to work out what and how this all happens. 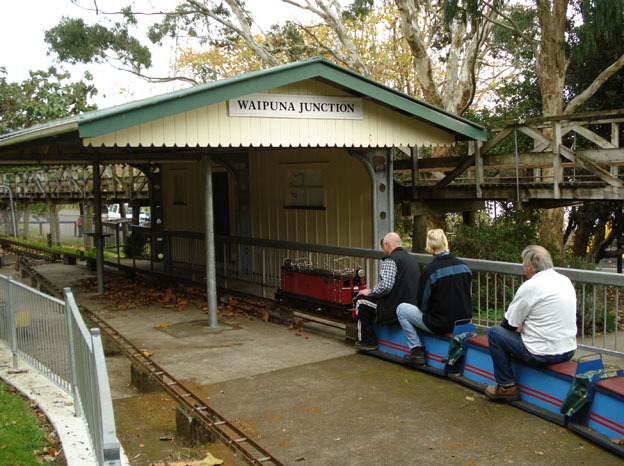 The station shelter (named Waipuna Junction) was rebuilt in 2003 and provides a start & end point for all passenger journeys. Here tickets are sold and clipped, passengers loaded, safety messages given and trains despatched. After travel around the track, trains return to the station and the happy passengers alight at the eastern end. Trains then proceed forward (with steam engines collecting coal & water as necessary) for the next trainload of passengers. The track passes over five bridges. The longest of these is a wooden trestle bridge some 76 metres long from which a good view of the chidrens playground and Panmure Basin can be enjoyed . A second trestle bridge on a curve shortly after the long one is 13 metres long – from this latter bridge one can get a good view of the boat pond. There is also a 10 metre steel truss bridge over the narrows section and two smaller bridges are over subways (one the pedestrian entrance by the station and the other the railway access track). In addition there are 3 pedestrian bridges. The large timber one crosses over three tracks by the Clubhouse and allows people to move safely towards the engine shed and station. The smaller steel bridge which has three ramps is at the eastern end of the station by the train unloading area. There are two tunnels, formed from pipes in the cut & cover method. The first is on the upgrade on the lower circuit and is on a 12.5 metre radius curve. It is 28 metres long – long enough to be dark even on a sunny day! The second tunnel is a straight, short 5 metre one, on the steep downhill grade from the upper curve. A good sized engine shed is conveniently located between the Clubhouse and Station. It serves several purposes; firstly it has storage racks for rolling stock, secondly a small workshop for maintenance, thirdly a tool storage cabinet and lastly it is used to store coal & wood for steam engines. This is the 9 metre long, low, narrow concrete block building by the engine shed. It has two tracks and these are used to store the club’s ready made-up train sets – each has a battery powered locomotive and three trolleys. These are kept in this manner so they may be easily put into service each Sunday between 1 & 4pm (weather permitting) when trains are available for the public to ride. These are the 5 metre long raised tracks in front of the engine shed. Each one has a different configuration of rails to allow locomotives and trolleys to be serviced. In particular on days when steam engines are used, they are steamed up and blown down on these tracks – hence the name. The access track runs alongside the dogbox and down to the car park, passing under both the main pedestrian bridge and the inner curve of the downhill track (the latter via a small subway). The track ends under the subway but can be joined to the short section of track under the trestle bridge by a removable section of rails which lay over the middle curved track coming from the station. This short section of track at the car park end finishes by the car ramp. Members & visitors bringing rolling stock to run at ASME use this means to access the railway. The traverser is the large piece of yellow plant in front of the engine shed. It makes easy work of moving any locomotive or trolley to or from the various tracks at the engine shed. Work is continuing to add more tracks at the station – these will include two loops for trains to pass or park on. Before this can be done, the complex job of designing and building points, to suit 3 gauges without large rail gaps, has to be completed and tested. These are covered under Safety.